If you’re left-handed, you’re part of a small group – only about 15 percent of the population. 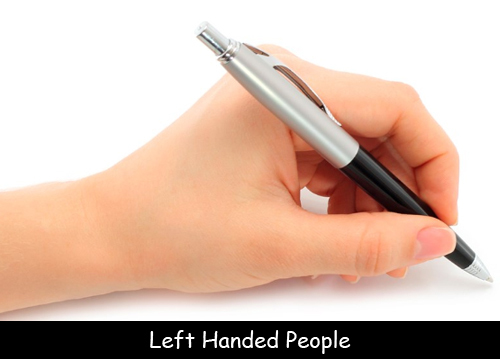 Scientists have a couple of varying theories about why some people are left handed and some are right handed. One theory says that left handedness is an evolutionary leftover. Scientists believe that most of the human population evolved so that the left hemisphere of the brain controls speech, language, and the right hand. In those who are left handed, the right hemisphere of the brain usually controls speech, language, and the left hand. Another theory says that handedness is a hereditary trait. People who are left handed have a certain gene that causes that trait. This trait can run in families. Previously, left handedness was seen as a weakness. Left handed children were sometimes made to learn to write with their right hand. Four recent U.S. presidents are southpaws – Barack Obama, Bill Clinton, George H.W. Bush, and Gerald Ford. Question: What does it mean to be ambidextrous? Answer: Someone who is ambidextrous can use both hands equally well. Quite a few people can use both their hands, but only about 1 percent of the population has no preferred hand and goes back and forth between the left and right. Many people who are ambidextrous probably started out as left handers. Researchers have found that people who are ambidextrous are often good at sports; they’re also more likely to have ADHD and schizophrenia. Leonardo Da Vinci, Benjamin Franklin, and Albert Einstein were all ambidextrous.